At Jim’s Antennas we’re the Master Antennas specialists (MATV). Call us on 131 546 for Commerical Property MATV and SMATV installations, repairs & servicing. If you own or manage a commercial property, such as a hotel, hospital, office complex or a block of apartments or flats for example, you may be wanting to allow visitors and tenants to access TV programs from multiple locations. Often such an offering is expected or it might be that extra touch that means customers choose your services over a competitor. The needs of such properties will understandably differ greatly from residential properties, where there may only be one or two televisions. Our experienced and professional expert technicians are trained in meeting the multiple TV needs of any commercial property. For the differing needs of commercial properties, you may want to consider our MATV and SMATV services. A master antenna, or MATV, is basically a system whereby one centrally located antenna supplies free-to-air TV signal to multiple locations. It is far more cost effective and functional than installing multiple antennas for each individual TV. SMATV is similar to MATV although the signal is received via satellite. MATV and SMATV are often used together to allow for both free-to-air and Pay TV to be received. If you’re looking to install an MATV and / or SMATV system in your commercial property, Jim’s Antennas is here to help. We only use the highest quality components and equipment, and our technicians are specially trained in commercial installations. 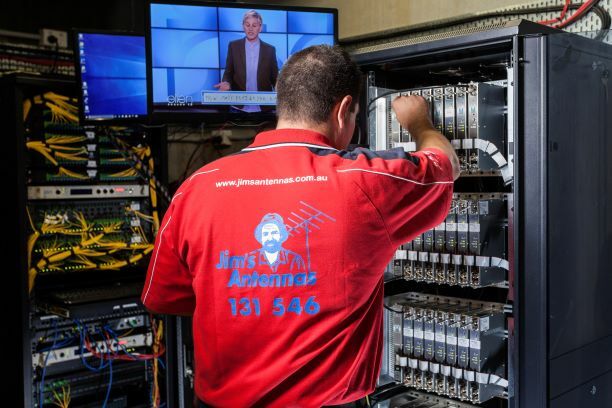 To find out more about our MATV and SMATV services, and to get a free, no obligation quote, call us today on 131 546 or fill in our online quote request and we’ll get back to you.